Dogs are special animals. We all know that. For centuries, man’s best friend has pulled sleds, rounded up livestock, tracked down criminals, and guided the handicapped – all while providing laughs and companionship along the way. 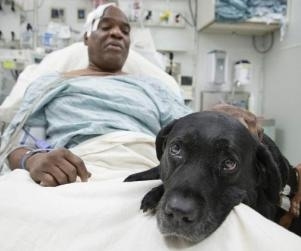 61 year old blind New York resident Cecil Williams has as deep an appreciation for dogs as anyone. For almost a decade now, his Black Labrador seeing eye dog Orlando has singly handedly (pawedly?) guided him around the urban maze of New York City. On Tuesday, Orlando did more than just walk Williams around the city. He saved his life. Williams was waiting at a subway stop in the city when he suddenly felt light-headed. As a diabetic, this is no doubt a frightening and familiar feeling for him. Williams was dangerously close to the edge of the train tracks when he started wobbling. Orlando began to bark and pull Williams away from the tracks, but the man’s weight proved too much for the dog to hold back. Williams fainted, and fell off the platform down onto the tracks. Orlando jumped right in and barked, licked, and nudged Williams in an effort to wake him up. The dogs barking grabbed the attention of other passengers at the platform. Witnesses ran down to the edge of the station where the train entered from and frantically waved their arms in an effort to get the attention of the train master. It worked. The train master slowed the train while a witness yelled at Williams to put his head down. The train passed right over Williams and Orlando. Williams and his canine hero were lifted up from the tracks by rescue workers and taken to the hospital. Williams only injury was a deep gash on his head from the fall. “The dog saved my life,” Williams said. "I'm feeling amazed. I feel that God, the powers that be, have something in store for me. They didn't take me away this time. I'm here for a reason." The gratitude expressed for Orlando by Williams was soon dampened by a sad realization: Orlando is retiring from his seeing eye duties soon, and Williams doesn’t have the money to keep him as a pet. Seeing eye dogs are not typically owned by the person they guide, but rather by an external company that works with insurance companies. If he had the money, Williams said, "I would definitely keep him." Problem solved. After Williams’ story made headlines, hundreds of readers offered their support and asked what they could do to help Williams keep his companion. A Go Fund Me page was set up and readers donated over $28,000, ensuring that Williams and Orlando won’t be separated anytime soon. Faith in humanity: restored. How's that for a feel-good holiday story?